I am sitting in my study after a day of working on cars and bikes and doing some cleaning, a day of planting and working in the yard, and a day of washing clothes, some planned and some unplanned. While I was up pretty early, that is the norm for me. I cannot sleep the day away, but I have always been that way from the time I was a small child. When it is light, I am up; it matters not if I went to bed only a few hours before, I will be awake and the idea of falling back to sleep is not within the realm of possibility. I will admit to my usual 45 minute power-nap later in the day. I got most of what I wanted to get done in the yard and around the house completed, so that is a nice feeling. I have spent that last hour and a half working on my Spanish, both with the computer and with flashcards. I need to work harder than I have. I have a lot I want to learn in the next weeks. It is hard for me to believe that it was 44 years ago that I was confirmed at Riverside Lutheran Church by our interim pastor, the Reverend T. P. Solem and that it was 41 years ago today that I walked across the stage as a member of the first graduating class of West High School in Sioux City, Iowa. I was such a little boy at that time. Even though I had already enlisted in the Marine Corps, I was certainly not ready for what would come some 27 days later as I took my first flight from Omaha to Denver and Denver to San Diego. Amazing the changes I have undergone. I think the most significant change or realization is what I deem important. I have often said what I thought was important (and now I might say 41 years ago) at one point does not seem so very important now and things I thought were “not” so important have begun of the utmost importance. I have learned that you can have all the “stuff” in the world, but none of that really matters. In the 30 years that I have been fighting this Crohn’s issue, I have learned that when you do not feel good or when your health is not good, nothing else really matters because you are not able to enjoy those things, whatever they might be. There have been days and even some weeks where I was in so much pain or so ill that I merely existed. That is not really life; it is just going through motions of living. Again, all the stuff or money in the world will not change that. I often think of the way that life changed for the late Christopher Reeves because of a chance-accident. He was successful, wealthy, handsome (he was Superman), and in an instance, it all changed. Okay, so as often the case, I started this post, but did not get it completed. So it is now Tuesday, and I was awake earlier than I wanted, but that might be the new norm. It might be good that I waited a few days before I finished this as I have a better perspective on a couple of things. Over the last couple days I did some work to help a student for whom I have some great appreciation. That situation has forced me to consider why people go to college and whether college (or at least the undergraduate aspect of it) should really be considered mandatory. Even as a college professor I cannot answer this query in the affirmative. When we allow under-prepared students for whom the university receives a lot of money, come with little chance of succeeding, I believe we are guilty of exploitation. It is wrong and it is unethical. That is the situation in which this student currently resides, if you will. Something better must happen or the student ends up 10s of thousands of dollars in debt with little chance of ever obtaining a degree. Furthermore, because of that debt, their chance of ever getting to return is minimal at best. It is my hope that we have come up with a better option. People often lament that they wish they could know what they know at some point later in their life and go back and re-do or start over. I am not one of those people. If I would have known all that would happen to me, I am not completely sure I would have wanted to continue. In addition, and I do understand the following statement might make me sound even older than I am, I am certainly sure I would not want to be venturing out into the world as a “20-something” right now. As I write today I find myself trying to understand some new version of what or who God is. Nothing significant, right? I am imagining how Anselm must of struggled with that question. I am struggling with wanting to know what will happen in the next weeks, or hopefully months, and then not wanting to know anything at all. However, as I was reminded in a conversation again last night: “everything happens for a reason”, and their somewhat logical extension of that was ” then there are no miracles”. I see some truth in the progression of those two ideas, but perhaps the question is must we disregard, or do we then lose appreciation for that which appears miraculous, because we are unaware of the reason? If we jettison the miraculous, does that affect our ability to hope? I think that might be the next conversation. Or at least a starting point. As I pondered the two days of conversations, it seems to be another form (and I am not really comfortable with that word) of a sort of religious humanism, a different strain of rationalism, but one that demonstrates a more profound appreciation for the numinous. By the way, it is now Wednesday morning and I am still writing. That might be a new record for blog-procrastination. 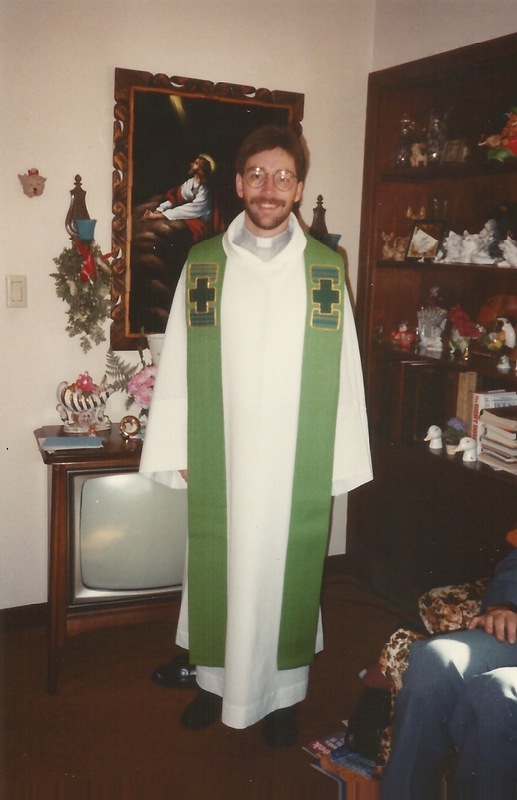 The picture is of me on my ordination day in my religious trappings, if you will. I will say this, I am continually amazed by Melissa’s thought processes. Certainly not typical of someone her age, or at least of the overwhelming majority of people her age. I have teased that she is a 50 year old in a 22 year old body. After being around her the last few days, she also has a part of her that is about 70. I am sure she’ll appreciate that, but it is there. I also know she won’t ask me what I mean even though she does read this. Escucharle y reloj como su proceso de pensamiento trabaja es realmente una alegría. Si sólo una gente más tomara el tiempo para hacer lo que usted hace, creo que nuestra sociedad estaría en un mejor lugar. Gusta me realmente su postura que tenemos la capacidad, y estoy de acuerdo que hay un tiempo y un lugar cuando la gente podría entender finalmente esto. Lo que es milagroso es que usted lo ha hecho tan temprano en la vida. That is why I think she is a walking oxymoron. There are so many ways she is way beyond and seems to be an older soul, but when listening to her music or some of the other things she says and watching what she does or does not do, it is not logical to me. Of course, it is not her job, nor anyone’s for that matter, to be such. However, as she noted last night in her questioning, why does everything have to be logical? I guess she is right. Perhaps it is because I find comfort in logic. Maybe we all just walking oxymorons. Wow! You look soooo young in that outfit. Almost too you for the profession. Melissa is amazing may I say and you have her pegged just right. In spirit she is so youthful, fun and free spirited and yet sometimes her words and thoughts are so wise she seems older than her years. I love being with her because no matter what I always leave her feeling happy and relaxed. I appreciate her also always saying what she feels even though I may not want to hear it. Friends like her are hard to come by (even if she is Canadian). I continue to pray for you as you go through this journey. Hoping you find the joy in something in each day you rise. By the way was in town and went past your house the other day. What a great house and I totally live the firepit area you designed. What a great view you must have. kind words Michele but a different Melissa. Michael is inundated with us! There are actually 4 Melissas, so your are more accurate than you even realized! !